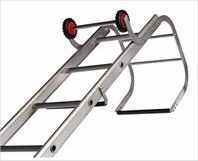 Various types of ladders are available. When considering buying or hiring a ladder, look at the choice available and decide what kind you need for the work you are going to use it for. For occasional work it will be cheaper to hire what you want when you want it. It is probably worth while buying a set of multipurpose steps to suit your most frequency needs. A platform step ladder gives stable working position with a high level platform for resting tools and materials being used. Available in various heights and with or without a high level hand rail. This type opens up like scissors to give a free standing set of steps with a small platform at the top, thus leaving your hands free and saving the need to keep getting off the steps for tools and materials. They are very stable and, if fitted with a handrail above the platform, extra safe. When choosing a platform ladder, make sure the treads are wide enough to allow you to stand comfortably for long periods. 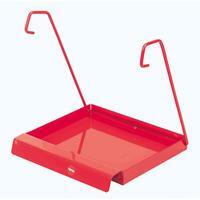 When not in use, the steps fold up and are quite compact to store. A combination ladder offers various arrangements to give a step ladder, an extension ladder and a stair ladder in one piece of equipment. The combinations fold down to about the same size as the platform step ladder but is much more versatile. Three way combination ladders (illustrated right) consist of a pair of ladders which can be arranged in three different configurations to give a simple step ladder, an extension ladder and a step ladder which can be positioned astride steps. Four way combination ladders consist of 3 ladders which can be arranged in the same ways as the 3 way plus an additional arrangement which provide an extension to the basic step configuration. 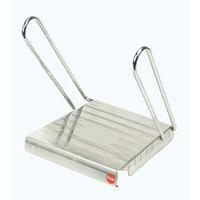 If you live in a bungalow or flat, a combination ladder should be sufficient for most jobs. Extension ladders are used for working at height. These consists of two or three parts which can be slid apart to give the required height. Available as two or three extensions and in various 'closed' lengths (2.5 to 3.5m). A double extension ladder, which can give a length of up to about 8 meters, should be suitable for most two storey properties. Longer, 3 section ladders can give lengths up to about 10 metres. On smaller ladders, the ladder may be extended by hand and secured with stay locks which rest on to a selected rung. On larger ladders, the sections are extended by means of a rope loop running down the side of the ladder and secured upon a cleat. As the average diy'er will use an extension ladder infrequently, it is probably better to hire one when it is required. Although if you do use an extension ladder frequently, it will be more economical to purchase one. Always use this type of ladder when working on a pitched roof - fit it and climb onto it from scaffolding (or a scaffold tower), not a ladder. The roof ladder has two wheels at the upper end which enables it to be pushed up the roof without damaging the slates or tiles. On the other side to the wheels, the ladder is formed into a hook which fits over the top ridge of the roof and stops the ladder from slipping down the roof. Ladders are available in either aluminium or fibreglass (timber ladders have more or less disappeared from the market). Fibreglass adders cost more that aluminium, but they do have advantages. Aluminium is lightweight and durable, but bends easily and can present risks when electrical work is being performed. Never use a metal ladder to do electrical work unless it is fitted in insulated feet. Aluminium ladders can corrode and weaken by salt air or chemicals an aluminium ladder. The aluminium sections can also be bent if they are knocked or fall, a distorted section cannot be reliably repaired. Fibreglass is not as light as aluminium, but it does not conduct electricity, is not susceptible to damage by moisture or rot and does not bend easily. Fibreglass ladders have not been available for very long, as time passes disadvantages to them may come to light. All steps and ladders have a weight rating which indicates the load which will be safely placed on it. Look at the quality of the connections and hinges on the ladder, if they look weak and liable to break, they probably will. To calculate what length of ladder you need, work out the highest point at which you will want to stand when working and allow for the ladder to extend at least three clear rungs above that point. Remember that the foot of an extension ladder has to be away from the base of the wall by about a quarter the height of the ladder, so the working height will be less than the length of the extended sections. Also remember that the sections need to overlap, a 2 section 3.4m ladder will give about 6.2m working length and a 3 section 3.4 ladder will give about 8m. Various ladder accessories can be bought or hired. Some of them are worth using as they make working at height more comfortable and convenient. Clips onto a rung to provide a convenient area for tools and materials at the top of the ladder. This attachment holds bucket and tools in a high position. A stout 'S' hook may also be used to suspend a bucket or paint can, but is less versatile. One end locks onto the top two rungs of the ladder and the other end rests against the wall so the ladder is held off a small distance from the wall. It allows the underside of the eaves and guttering to be worked on without having to lean back. Very little maintenance is required for aluminium or fibreglass ladders. Check that the hinges of step ladders are not binding and that the sections on extensions ladders slid freely - aluminium to aluminium friction can weaken the material over a period of time. On extension ladders, check where rope is used, that it is in sound condition and the fixing positions are secure/undamaged. Fit new rope as soon as there is any sign of fraying. Step and combination ladders can easily be stored in any dry corner but make sure they are not likely to be damaged or twisted. An extension ladder presents a bigger problem due to its size. An ideal place is the garage, where it can be kept dry and under lock and key and possibly hung along the wall on strong hooks or angle brackets and make sure it is well supported in the middle. Make sure that any ladder is secure and not available for the local burglars, a bicycle style security chain is useful to secure a ladder to a metal eye in a wall or other fixed point. see the HSE website for safe use of ladders.